A little while ago, I made some confit rabbit by slowly and gently cooking the jointed legs from a brace of rabbits in goose fat for a couple of hours and then storing them in the fat. It’s a centuries-old technique that produces the most flavourful and tender meat imaginable. To use the rabbit, all you have to do is dig a joint out of it’s blanket of fat and flash it in a hot oven to crisp it up a bit, or shred the meat directly into a salad, perhaps. Or you could do this… Warm enough sunflower or vegetable oil to deep fry in to a temperature of 150c. I shouldn’t need to go into the obvious dangers of dealing with vats of boiling oil, but I will anyway – do not, under any circumstances whatsoever leave the oil unattended. Make sure your pan is firm and stable before you start, or better still, use a proper deep fat fryer with a thermostat. In fact, I won’t deep fry ANYTHING unless I’m using a thermostatically controlled fryer. Hot oil terrifies me, and fear, in this case, is a very good thing. Whilst the oil is heating up, wipe the confitted rabbit legs clean of as much as the preserving fat as you can and liberally brush them with Dijon mustard. Dust the legs in flour, dip them in egg and roll them in breadcrumbs. I used store bought crumbs of Polish origin this time, and they gave an excellent result – fine and crisp. Deep fry the joints for seven minutes before removing them to a plate lined with kitchen towel to drain. This is very high calorie food, and it’s very rich indeed. A simple, plain salad is all you need on the side, dressed in a sharp dressing heavy on the lemon to cut through the richness of the rabbit meat. I’ve cooked rabbit many times, but never with any huge success. It’s cheap and plentiful, and there’s a superb gamey flavour to it, but my previous attempts have always missed the culinary mark, to the point where Jen rolls her eyes and looks disappointed when I tell her that I’ve picked up a rabbit. The combination of techniques here – confitting and deep-frying – worked wonders. The first stage tenderised the meat and worked up it’s natural flavours, the second stage gave it a smack of crunch and an extra layer of mustard flavour. That looks amazing! Its probably no worse than any high street fried chicken, and at least its worth the calories for the sake of the flavour. You're right – no crap added whatsoever, and completely unprocessed, so technically healthy. It does work like that, right? Congrats on getting rabbit to work for you! It is available in Bulgaria, but you have to know someone on a farm and they will kill it for you. A bit labor intensive, not for me necessarily. Good luck! YES! This looks outstanding! A little richness now and then as a treat isn't such a bad thing, no? Wasabi Prime, yep, I feel a bit smug about this one! 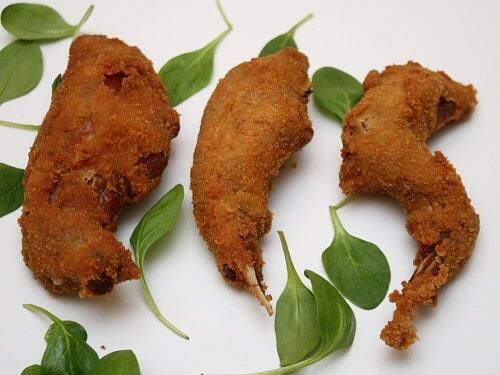 I absolutely love the fact that you have not only cooked that bunny in fat to start off with, but then deep fried it. Respect to you. Helen, well, if you're going to eat unhealthy but delicious food, you might as well do it properly. On the train home from work today I stared out the window and counted the bunnies in the fields (there were hundreds, seriously) and thought about all the delicious meals they would make… bring back hunting from trains, I say! It may have decimated the American buffalo but surely there are enough rabbits that their population won't suffer too much. My rabbit ragu was a mostly unqualified success. I think confit might be my next rabbit trick next time I get hold of one. I am definitely making that cake tomorrow – I had everything ready to go tonight but as usual I spent too much time blogging. Paul, do try it – it’s worth the work. Enjoyed your piece on the Guardian Leeds site, by the way. Wow. After all the websites and blogs I read on a daily basis, here's something I've genuinely never seen before -and will be trying. Excellent, they look lovely. Interesting recipe! I've never tried breaded rabbit before. It must be delicious! Thanks for idea!